On two occasions since The Interface was launched two years ago, the happy tranquility of our group was deeply disturbed. First, in December 2012 came the tragic loss of the daughter, Fay, of one of our group members to cancer. Second, in September 2014 we lost one of our longest-serving members, Harry, to a stroke. Fay and Harry were extraordinary individuals whose contributions to our discussions sounded very much like the Spirit of God speaking the Word of God through them. And it was the Word of not just any God, not just the Christian God; it was the Word of the God of us all. The eternal seeds Harry and Fay sowed through their contributions to the group sprouted and grew into two books that will, we hope, spread the Word to a wider audience. 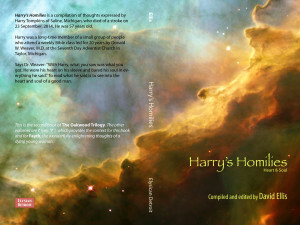 The seed sown by Harry resulted in Volume 2 of The Oakwood Trilogy: Harry’s Homilies: Heart & Soul. It consists of comments Harry made on such topics as goodness, evil, faith, doubt, truth, and other topics of discussion at our weekly meetings. 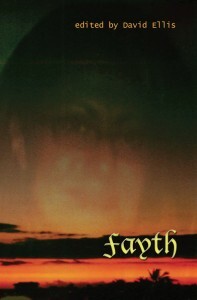 The seed sown by Fay grew into Volume 3, Fayth, which brings together a discussion of the topic of Evil, Fay’s response to the discussion, and a New York Times article showing that the Word of God does not always need to be spoken out loud. Volume 1 of the Trilogy is a book still in preparation, tentatively titled Next Question? It will aim to provide insights into matters of the spirit but also serves to supply the context within which Harry’s Homilies and Fayth were compiled. That is to say, it will summarize the content of our weekly discussions and seek to draw not answers but, rather, higher level questions. Each volume of the Trilogy is a standalone entity and can be read independently and in any order, but each is intimately linked through our discussion group at Oakwood Seventh Day Adventist Church.